Most visitors to Brockhampton come to admire the thatched church built in 1902, and quite rightly so, because of its great charm and its importance as an icon of the Arts and Crafts Movement. But those who also turn their back to the church and look across the road see another interesting and attractive building in the shape of the lodge to Brockhampton Court, which dates from 1893. The owners of Brockhampton Court at this time were Arthur Foster who came from a Northern textile manufacturing family and his wife Alice, from a well-off American family. They were later to commission the new church, but in 1893 were concentrating on their home and employed Faulkner Armitage, an architect based in Altrincham, Cheshire, to design Elizabethan-style additions to the house and a new lodge. For the latter he provided the black-and-white heavily timbered building we see today. 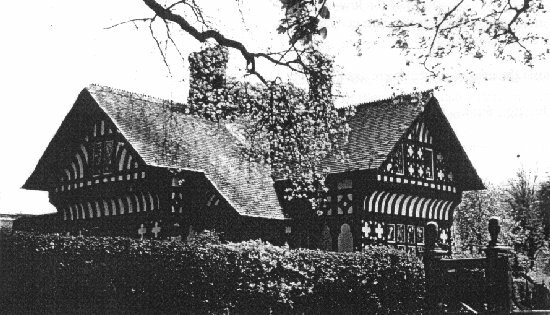 By the late 19th century it had became fashionable to build lodges (and indeed houses) in a half timbered "Old English" vernacular style, although Armitage's detailing evokes the local buildings of his Cheshire base (e.g. the National Trust's Little Moreton Hall), rather than native Herefordshire styles of timbering. What makes the Brockhampton Lodge particularly interesting is that the clerk of works was a young man from Armitage's office called Barry Parker. Three years later he was to form an architectural partnership with his brother-in-law, Raymond Unwin, and they went on to become the most prominent architects of the Garden City movement, winning the competition for designing the first garden city at Letchworth in Hertfordshire, and going on to work at Hampstead Garden Suburb in North London. The ethos of the Garden City movement was one of community and mutual help and the houses, with sizeable gardens, were to be solidly built with the emphasis on craftsmanship and the use of local vernacular building styles, including half-timbering where appropriate. Barry Parker's experience with Armitage of erecting buildings in vernacular styles, such as the Brockhampton Lodge, must have been helpful in his Garden City work. The influence of Garden City houses, can be seen throughout the 20th century, when the use of white render and blackened timbers in a more debased style was to be seen on the "Stockbroker Tudor" houses so familiar to us in the suburbs of our towns and cities. Even today nondescript new houses and blocks of flats may be tarted up with a bit of feeble fake timbering in the gable. So one can trace a clear line from Brockhampton Lodge via Barry Parker and the Garden City movement to the present day, although modern day houses scarcely bear comparison with the rich detailing of the Lodge.